Memory foam mattresses minimize pressure on the body and provide balanced support. They achieve this by molding to the body in response to heat and pressure, evenly distributing body weight. ​Indeed, when you lay on a memory foam mattress, it creates rapidly a personalized and balanced form around your body, supporting your weight evenly, eliminating motion disturbance and relieving pressure focused on your shoulders, hips, and feet. The result can be a unique and unprecedented sleeping experience. The mattress reverts to its original shape once the pressure is gone. ​Another advantage of memory foam mattresses is being less aware of a bed partner's movements because there are no coiled springs. It is also claimed that these mattresses might be especially helpful for older people, because minimizing extra movement could reduce the number of times they wake up during the night. On the negative side, memory foam can produce an odd smell when first used. To minimize this problem, it is recommended airing out the mattress for at least 24 hours before putting sheets on it. This should dissipate any smell. Finally, note that memory foam mattresses and similar soft materials should not be used in infants' beds, as soft bedding traps can increase the risk of sudden infant death syndrome (SIDS). The 3-layer design is composed of a top memory foam, a middle comfort foam, and a high-density base support foam. The 2-layer design is composed of a top memory foam layer and a high-density base support foam. Usually, there is also a knitted cover. The top memory foam layer molds to the body shape when it comes into contact with body heat. This helps to support your body along the curves and natural lines of the body, reducing downward pressure and stress on joints. The middle comfort layer relieves further pressure from joints and different body parts. The base layer is made of high density foam so it can support all the weight that's above it. This article will compare the Zinus Sleep Master Ultima and Signature Sleep Memoir memory foam mattresses. These were not just the most popular among Amazon customers at the time this article was written, but they had also received excellent reviews from most Amazon buyers (average rating of 4.5 out of 5 stars for each of the two brands!). 6-inch mattress: 1.5" memory foam and 4.5" high density base support foam. 8-inch mattress: 2" memory foam, 2" comfort foam, and 4" high density base support foam. 10-inch mattress: 3" memory foam, 2" comfort foam, and 5" high density base support foam. 8-inch mattress: 2" memory foam and 6" high density base support foam. 10-inch mattress: 2.5" memory foam and 7.5" high density base support foam. 12-inch mattress: 4" memory foam and 8" high density base support. Twin: 39" x 75" . Twin XL: 39" x 80" . Full (Double): 54" x 75" . Queen: 60" x 80" . King: 76" x 79" . California King: 72" x 84" . Zinus infuses its memory foam products with natural plant oils to maintain product freshness. For exact prices, please refer to the Amazon products section below and click the provided product links. Note that the Amazon price often includes a generous discount to the list price. If a discount exists, both the Amazon price and the list price will be displayed when you click the Amazon product link images below. So which of the two memory foam mattresses to buy? Here we have two extremely popular memory foam mattress brands that offer you a variety of mattress thicknesses and mattress sizes. As mentioned, most Amazon customers have been very happy with these mattresses and, at the time of this writing, had given them an average rating of 4.5 stars (out of 5 stars)! Therefore, you will probably be happy with either brand. Zinus Sleep Master Ultima also offers mattresses with three foam layers, while Signature Sleep mattresses have two foam layers. The third foam layer which is in the middle may provide extra comfort. Zinus Sleep Mater Ultima comes with a 10-Year warranty as opposed to the 1-Year warranty that comes with the Signature Sleep brand. Zinus Sleep Master Ultima mattresses are infused with natural plant oils to maintain product freshness. If these points are important to you, you might want to consider a Zinus Sleep Master Ultima mattress. Otherwise, there is a good chance you'll be just as happy with both brands. 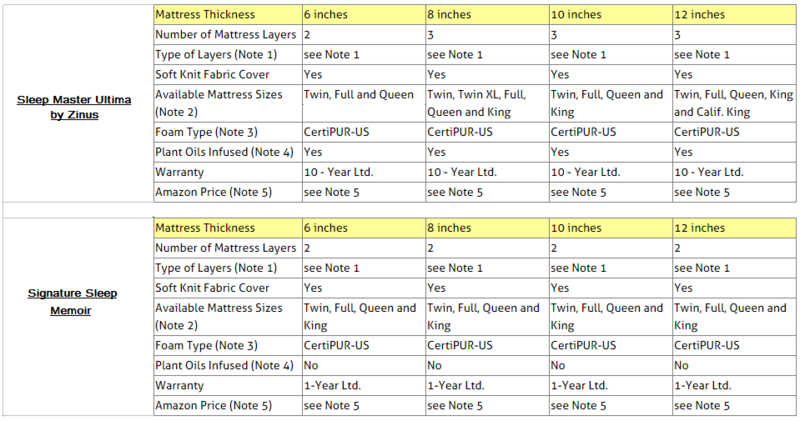 You will find below Amazon product links to view or purchase all the Zinus Sleep Master and Signature Sleep foam mattresses available for the various mattress thicknesses and mattress sizes listed in the above comparison table. You will find below Amazon product link images that will give you a choice of Zinus foam mattresses corresponding to all combinations of mattress thicknesses (6, 8, 10 or 12 inches) and mattress sizes (Twin, Full, Queen, King, etc.). Do you also need a Platform Bed for your foam mattress?